The DSM-40NM-E Gigabit Console Server delivers secure in-band and out-of-band access to 40 RS232 serial console/maintenance ports on your switches, routers, firewalls or other mission critical devices. The DSM provides around the clock access to remote networks, eliminating expensive and untimely truck rolls. When the network is down and you need to quickly and securely access failed equipment to bring it back online, an out-of-band solution with primary and secondary gigabit ethernet ports is a must. The DSM-40NM-E includes dual 10/100/1000 ethernet ports with full fallback capabilities. This helps to assure that even if your primary network is not available, you can still access the DSM-40NM-E via secondary network in order to communicate with serial ports on remote devices. 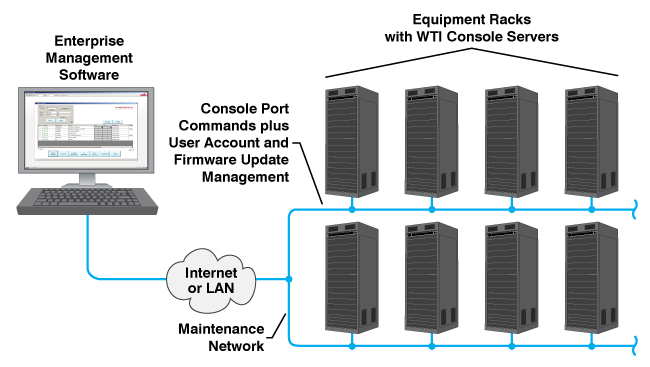 When communication via the primary network is interrupted, fallback capabilities enable the DSM-40NM-E to automatically switch over to the secondary network, providing dependable access to remote ports when needed the most. The DSM-40NM-E can remotely monitor network devices, including WTI power switches, constantly watching for significant changes. Administrators are promptly notified via SNMP or email when high temperature, full port buffers, invalid access attempts, communication loss to network equipment or other critical events are detected. Secure SSHv2 encryption, HTTPS/SSL secure web, port-specific password protection, IP packet filtering and other security features allow the DSM-40NM-E to be used in the most secure environments. The DSM-40NM-E is ideal for mission critical applications, where power redundancy is required in order to ensure uninterrupted access to command functions on vital network devices. The DSM-40NM-E includes two power inlets to allow connection to a primary power source and a secondary power source,providing continued console port access, even if the primary power source fails. The DSM-40NM-E allows administrators to use managed MIB objects to edit subscriber accounts, set configuration parameters and display unit status. In addition to these MIB based management and control features, SNMP Traps can provide notification when alarm events are detected. The DSM-40NM-E allows outbound SSH and Telnet connections to be initiated from a free RS232 serial port. Providing that outbound SSH/Telnet is enabled for the individual subscriber, this provides users and administrators with the ability to connect to other network devices via TCP/IP. 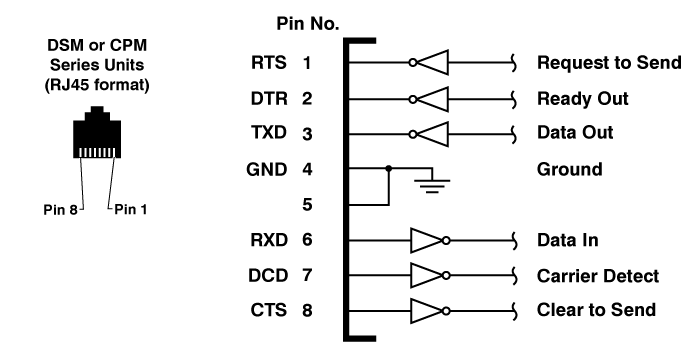 When enabled, the DSM-40NM-E will ping IP addresses or domains, specified by the administrator,according to a set schedule. If the device at that IP address or domain fails to respond, then the Ping-No-Answer alarm can provide notification via Email, Syslog Message or SNMP Trap. The DSM-40NM-E can provide prompt notification via Email, Syslog Message or SNMP trap when serial communication with an attached WTI device is disrupted. The attached WTI device must have the'Heartbeat' feature enabled. Secure Shell (SSHv2) encryption and address-specific IP security masks prevent unauthorized access to command and configuration functions. The DSM-40NM-E also provides four different levels of user security; the Administrator, Supervisor, User and View Only level. The Administrator level, which is intended for use by system managers and other administrators, provides complete access to all port connection / disconnection functions, operating features and configuration menus, and also allows access to any port on the switch. The User level is ideal for co-location applications, since users are only permitted to view status and connect to the ports allowed by their user name and password. When the DSM includes the W4G Cellular Modem Option, the Wake-Up on Failure feature can be used to put the cellular modem into a non-connected sleep state, with the wired Ethernet ports acting as the DSM's primary network interface. When the Wake-Up on Failure Feature is enabled, the cellular modem will only wake up when the DSM determines that communication via the wired Ethernet port(s) has failed. Since the cellular modem is only activated when needed, this helps to improve security by minimizing communication via cellular and utilizing cellular data only when necessary. Each RS232 serial port of the DSM-40NM-E can be individually accessed by number, name, or group via SSH or Telnet sessions. The DSM-40NM-E also allows direct connections using TCP port assignments. Each serial port can be separately configured using simple menu driven commands to set the port password,data rates, flow control and other operating parameters. The full matrix capability of the DSM-40NM-E allows you to easily connect any two ports on the switch, even when the ports are using different communications settings. Ports can also be connected or disconnected by a third party with supervisor rights, and system managers can swap various RS232 devices between ports at a remote location. "Buffer Mode" allows individual ports to capture and store incoming data, such as error and status messages received from attached console ports. This "snapshot" of the last data received is stored in memory, and can be viewed, saved or erased by the system operator at any time. Console messages can be stored in the DSM-40NM-E port buffers, and sent to a remote location via SYSLOG, or an SNMP message can be generated to alert administrators when new console messages are received.